*I have updated this recipe as it has evolved slightly over the years. I still make it at least once a month and it is our go-to meal when we can’t decide what to eat! See a video of Jamie cooking the original recipe here. This recipe is adapted from Jamie Oliver’s 30 Minute Meals. 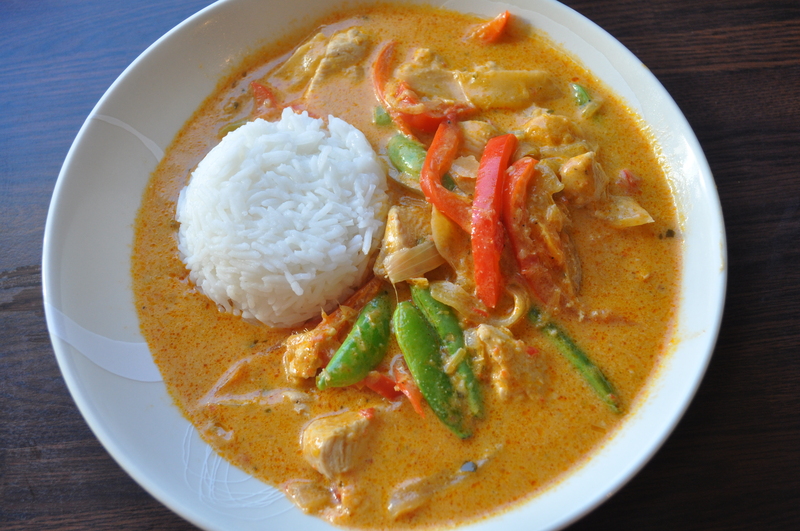 In the book this is a prawn curry, but I’m not a prawn fan so changed it to chicken. I think beef could work really well with this sauce too. Don’t let the long list of ingredients put you off, it really is very easy to make. And most will last for ages in your store cupboard. In the book there is a recipe for a cucumber salad to accompany it. This is delicious but I don’t always have the time – or inclination – to make it. I’m quite the lazy cow!! 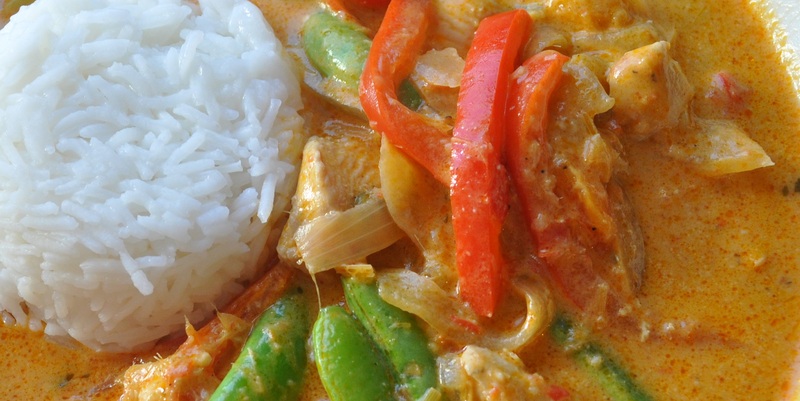 Serve with either basmati or jasmine rice. The fresh lime leaves make a big difference to the flavour, I get mine in M&S. Dried will do and should be available in most large supermarkets now or if you can’t get either some freshly grated lime zest is a good substitute. Top tip: Keep a little paste back and freeze it so that you’ll have it to hand to add extra flavour to a multitude of dishes. Trim the lemongrass and remove the tough outer leaves. Bash up the stalks and then roughly chop the lemongrass. 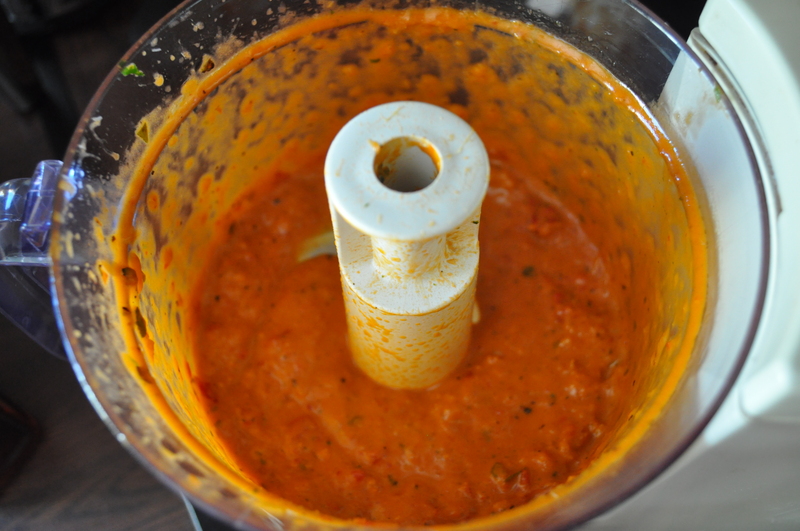 Add to a food processor, along with the chilli, peeled garlic, lime leaves, coriander, jarred peppers, sugar, fish sauce, soy sauce and sesame oil. 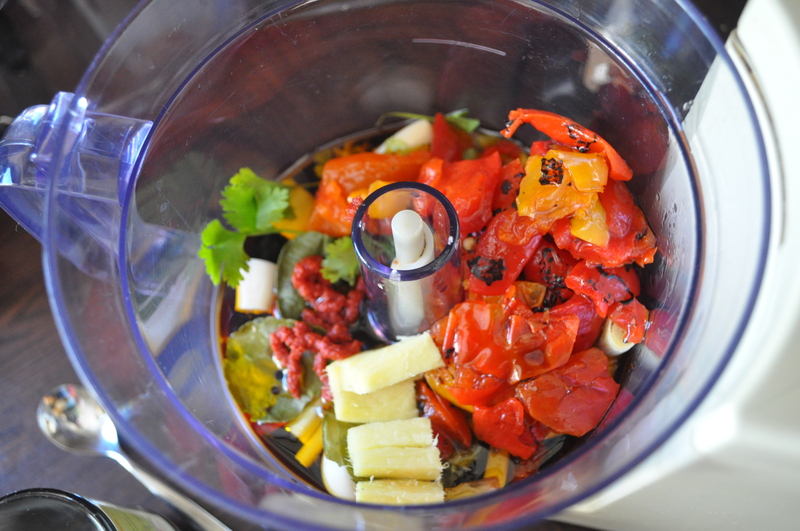 I also add some of the oil from the peppers as it helps the mixture blend. Peel the ginger and add. Blitz all of the ingredients to a paste. While the food processor is running, put a frying pan on a medium heat. Add a tablespoon of oil. Finely slice the onion and dice the chicken. Add the onions to the frying pan and cook until they start to soften. By now the paste should be ready and you can add it to the frying pan. Open the tin of coconut milk without shaking it and add the cream solids at the top to the pan. Fry all of this together for a few minutes until you can smell the paste starting to cook. 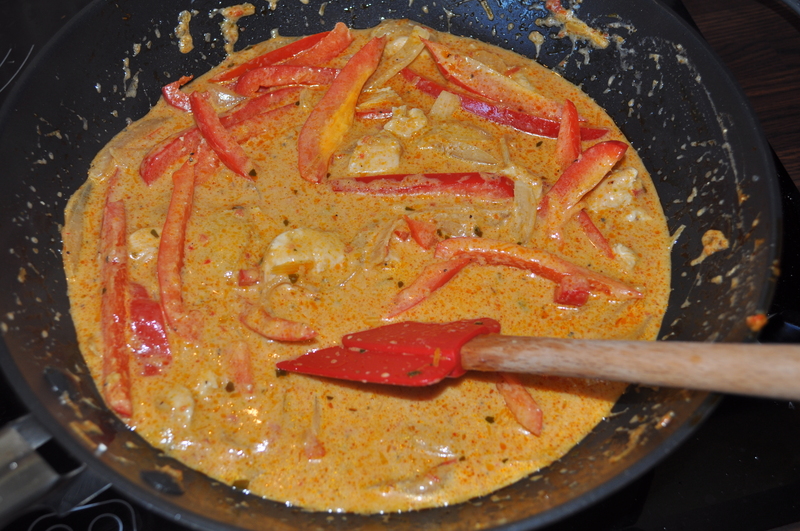 Add the remaining coconut milk to the pan and give it a good stir to combine it with the rest of the paste. Add the diced chicken. Finely slice the red pepper and add this to the frying pan. 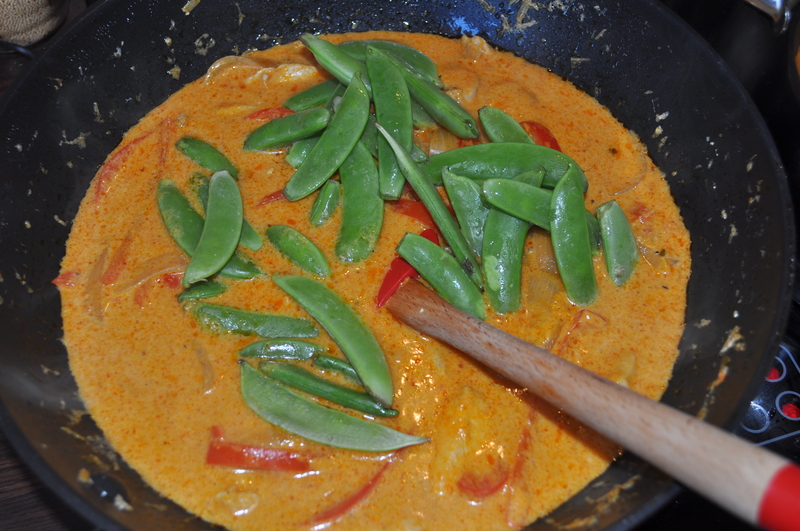 Heat the curry until it is bubbling but not quite boiling and then turn the heat down to a simmer and cover. Gently simmer the sauce for 25-30 mins or so in total. In this time you can prepare the rice.I like to keep the sugar snap peas very crisp so I don’t add them until 5-7 mins before serving. Check for seasoning and adjust accordingly but there should be no need to salt or pepper. Serve with lime wedges. Enjoy!! Looks tasty and easy! Trying it tomorrow. Thank you so much Craige! I hope you enjoyed it. Thank you so much for taking the time to comment Shane! I’m so glad you liked it. The recipes are really just a guide, leaving out some of the ingredients is perfectly fine. What kind of red chiles do you use? Thai bird peppers?